We live on a farm in a peaceful rural area North of Auckland, New Zealand, where we raise and fatten beef cattle and lambs. 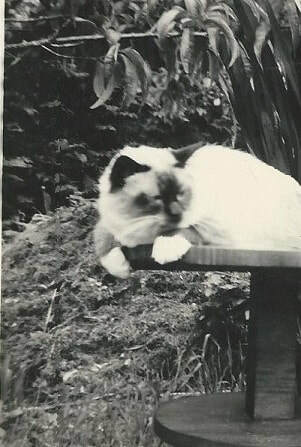 as there were no Birmans available in NZ, at that time worldwide they were rare. in Ancient Burma in the magnificent temple of Lao-Tsun , there was a beautiful Golden goddess Tsun-Kyan-Kse who had gorgeous blue sapphire eyes . Mun-Ha's soul transmigrated to his divine cat.